04 Mart 2019 Pazartesi 12:00 - 4 reads. By violent tornadoes in the South of the United States, more than 20 people have been killed. In the States of Alabama and Georgia, the search for the Missing runs at full speed. By strong hurricanes in the US States of Alabama and Georgia looking for rescue workers feverishly Missing. 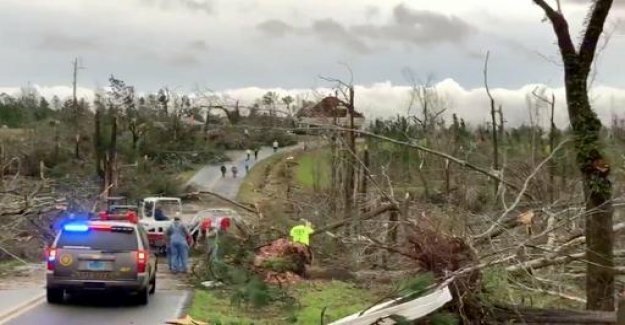 A series of tornadoes had covered late Sunday, the area to the South of the United States and in many places, the devastation left behind. At least 23 people were killed, many more are injured. The authorities assume that the number of dead will continue to rise. Particularly heavy, it had taken in Lee County in the state of Alabama Where the hurricane along raced on a country road, and struck a swath of destruction in the village of Beauregard: a number of single-family homes and caravans had been destroyed, many people were brought to hospital with severe injuries, reported to the Sheriff of Lee County Jay Jones. Among the Victims were several children. According to the weather service the first Tornado that hit Lee County had a diameter of almost a Kilometer. Images showed destroyed houses, uprooted trees and rubble-strewn streets. Close to the town of Smiths Station in a mobile radio mast crashed on a four-lane Expressway. In Thousands of households, the power went out.